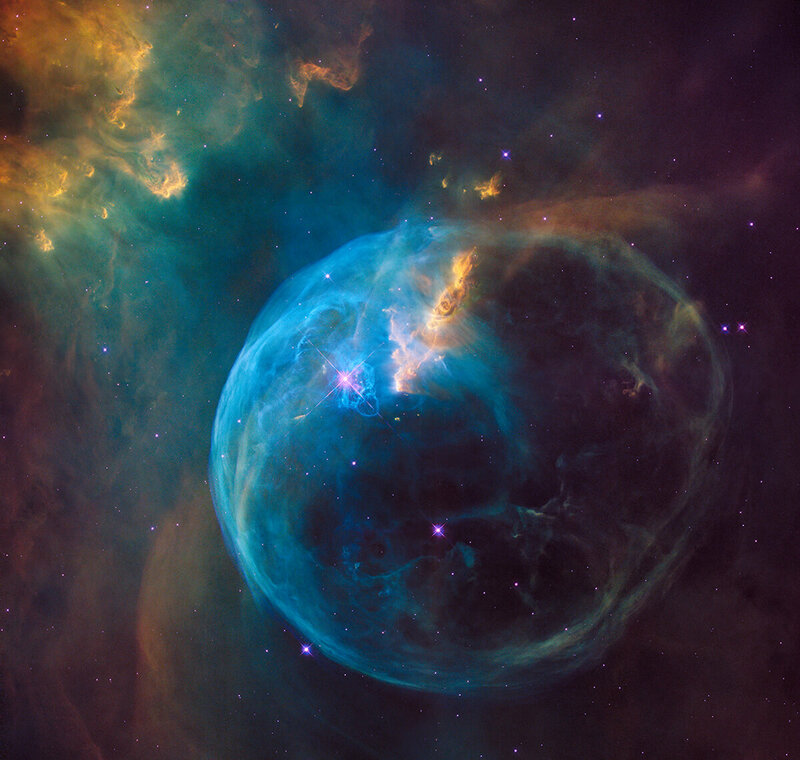 To celebrate the Hubble Space Telescope’s 26th anniversary in space, NASA released a series of images, videos, and simulations of an object known as the Bubble Nebula. In the main image, a giant star is blowing a cosmic hurricane into space, forming a brilliant halo as it smacks into the chill molecular cloud surrounding its parent star. Like all Hubble images, the immediate aesthetic appeal of this snapshot is only enhanced when we take a moment to consider its scale. The Bubble Nebula is 7 light years across and 7,100 light years from Earth. The star at its center is 45 times more massive than our sun and blows out heated gas in a “stellar wind” traveling four million miles an hour. While the image itself is spectacular, it got me thinking big picture. Hubble has taken images like this with such regularity for so long they’ve become something of an expected miracle. We marvel at them on a quick click, but it’s all too easy to forget why they’re so marvelous. It’s a theme I think about often when writing on technology. Television, computers, WiFi, the internet, cars, planes, electricity—all our best loved tools assume this miraculously mundane quality once they’ve settled into a routine of delivering on their promise consistently and without complaint. They fade into the background to form the fabric of our technological experience. Why? Because the vast majority of the time they work too damn well for the underlying technology to be noticeable. I recently read an article observing that smartphone improvements are now so incremental they’re boring. It’s true. But let me rephrase it slightly: Smartphones have been perfected to the point new improvements are unremarkable. Sure, we’re ready for the next smartphone moment, but it’s also nice to reflect on how we’ve arrived at this point. Writing about exciting technology means covering stuff that doesn’t work very well yet. It involves envisioning tech’s potential and soothsaying (often wrongly) about the amazing world we’ll live in one day. But we should celebrate boring technologies too because the sparkly world of tomorrow won’t seem so amazing when we get there without context. Smartphones, of course, really are miraculous. If you exploded one into its constituent parts in slow motion, Matrix-like, and told the story of each component, it would involve years, probably decades, of brain-breaking labor by teams of researchers and scientists. Every part was bigger, slower, and/or more complex. Today? Boring. Such a beautiful thing. Hubble is like that. And it isn’t. It’s true Hubble also represents decades of brain-breaking labor, took 12 years to go from funding to launch, and didn’t work at first. Its real anniversary may actually be three years after it arrived in orbit when an epic repair mission fixed its main mirror. And like other well-developed technologies, we’ve come to expect the spectacular from it. But Hubble’s relevance, its ability to dependably induce excitement 26 years on, is perhaps a greater feat than the mundane miracles of smartphones, computers, or other more pragmatic inventions. Hubble speaks to something in us beyond practicality and gratification. I found myself going back to a beautifully written article by Ross Andersen on why telescopes like Hubble matter. Andersen charts the evolution of the human eye all the way through its technological extension into the cosmos. He says telescopes like Hubble reduce the sun and Milky Way to mere pixels. They stretch our vision not just into space but over unseen wavelengths of light and through incomprehensible expanses of time. For ages the night sky was a “decorative ceiling—a fixed sphere of glittering stick-figure gods.” Now, thanks to our eye-extending technologies we have a far richer, more dimensional view, and we can deepen this sense of dimensionality with computer simulations of sweeping vistas—like this one of the Bubble Nebula. This may sound a touch melodramatic, but I think it’s one of the few times hyperbole falls short. Hubble provokes the inner poet or philosopher because it so sublimely straddles the aesthetic and the conceptual. It brings abstract theories into our realm of experience. The unaided eye can see the history of Earth in stacked layers of rock on a mountainside; looking through Hubble is the equivalent of this, only for the universe as a whole. You only need a few sentences and the Hubble Deep Field—a detailed glimpse of a tiny sliver of sky showing thousands of galaxies as they were billions of years ago—to bring the vast distances and time scales of cosmology home to pretty much anyone. It’s no wonder Hubble still compels us to look on in awe after 26 years. 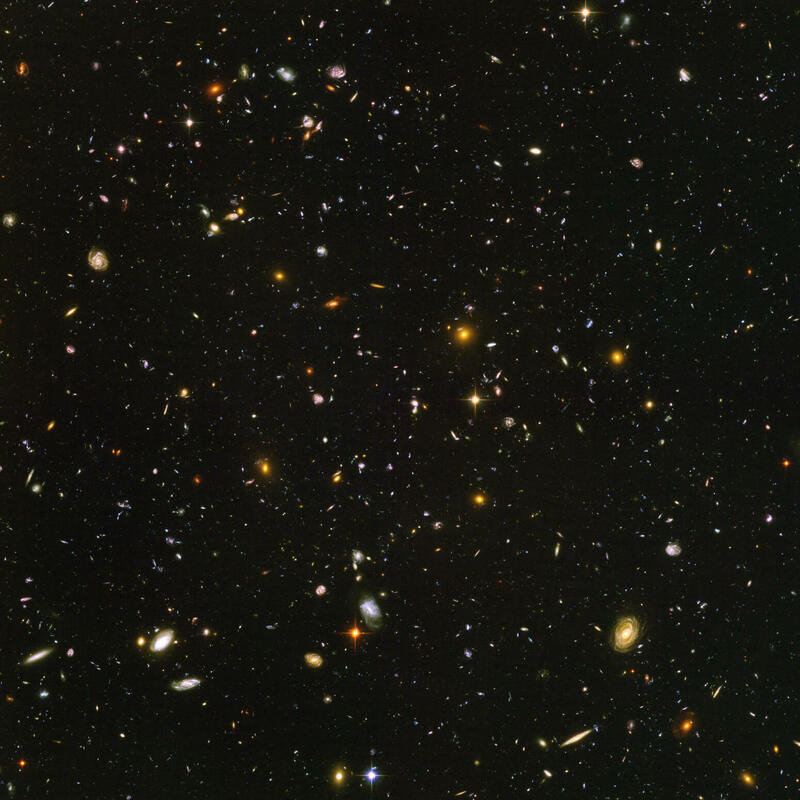 The Hubble Ultra Deep Field shows 10,000 galaxies—some dating back 13 billion years—in a small patch of sky 1/10 the diameter of the full moon.